We are a smart nation, a futuristic nation, a developed nation. We are a modern people, an educated people, an internet-savvy people. We believe in science, logic and material progress. Our universities are rising in the world rankings, our research gaining ground, this is the march of knowledge. Not for us the backward ways of the village. We are too sophisticated to fall for optical illusions, we definitely won’t fall into mass hysteria like the people in Kelantan for example. Deep down though, Singapore is a superstitious society (I mean this in a factual and not pejorative sense). And being a largely ethnic Chinese society, this is most clearly manifested during the Lunar Seventh Month. Popularly known as the Hungry Ghost Month (click here for a list of dos and don’ts), this is the month where the gates of hell are open and ghosts are allowed a holiday back to the world of the living to visit their relatives and do other things they want to do. 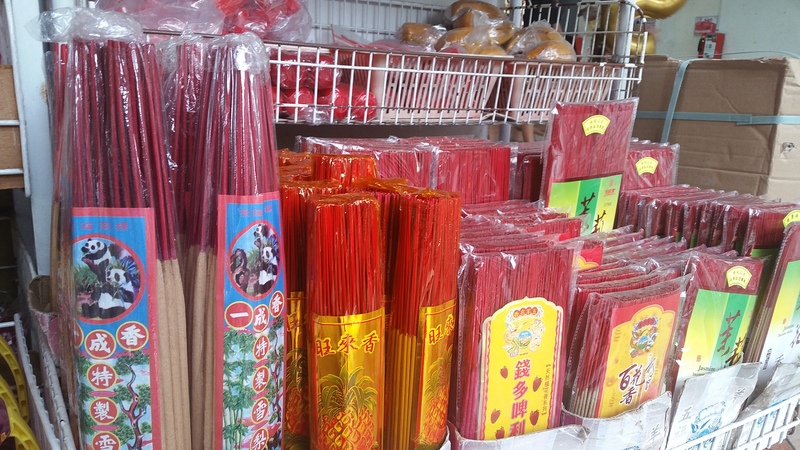 This is the month where the man-made PSI levels increases due to the fumes from burning of incense paper and joss sticks. What is being burnt and why, and what should you know? The practice of burning joss paper arises from the idea of filial piety (obviously not something limited to Confucian-influenced cultures). While cynically thought off as an attempt by elders to guilt trip their offspring, filial piety defined within the Confucian precept is explained using the concept of a wheel. The idea is that the older (and more mature people) look out for the younger and help them and in turn the younger as they mature, look out for the older. The young grow up because of the nourishment from the old and that creates a bond. The bond between them motivated by love then creates a virtuous circle. Having said that, it is not uncommon for the idealised story of filial piety to clash with reality. This concept was later linked to ideas like karma, which then tagged filial piety to punishment and reward and has been in some circles observed as a transactional relationship. Arising from filial piety is the question of how one looks after ones deceased. Chinese folk culture believes in the presence of a supernatural world. Inhabiting that world are three broad categories. Gods, ancestors and spirits. Gods include for example the Jade Emperor and his underlings. Ancestors, as the name suggests refers to one’s family members. And spirits refers to those who have died recently or whose are unknown and have no one to pray for them. In provincial parts of China there are usually ancestral halls with a large altar of ancestors going back hundreds of years and countless generations. The most impressive would be the ancestral halls of the Emperors, who would have altars of all their ancestors going back to the first emperor. Considering as some dynasties go back 6 centuries, thats a lot of ancestors. In Singapore such ancestral halls are largely forgotten by the average folk. Here, it is typical for practitioners to pray up to three generations back. What this means is that the people who died a long time back and have no one to pray for them end up as simply spirits. 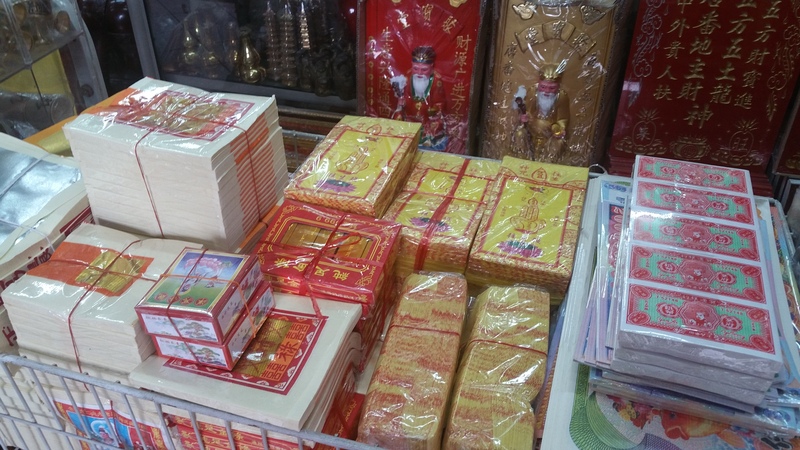 The mix of folk religion, Buddhism and Taoism creates the syncretic religious practice that is seen today particularly in the burning of joss paper. 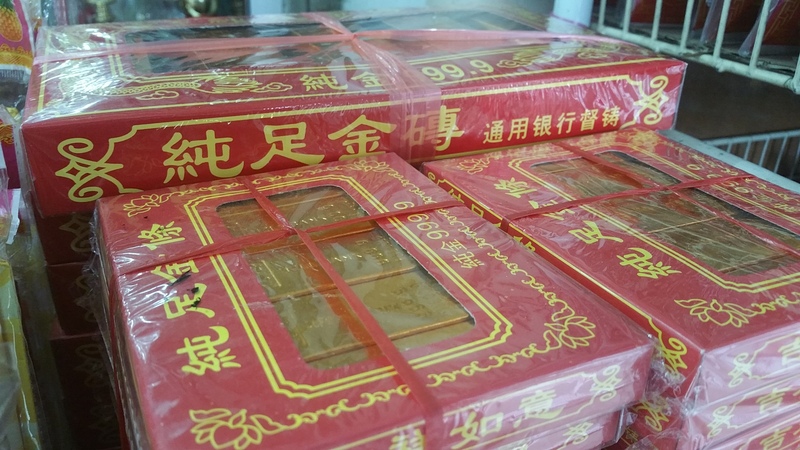 It is believed that the descendants alive can look after their deceased by burning joss paper for them. The power of fire transporting these items into the supernatural world. The most common items were originally hell money. The economy of the supernatural world has three tiers, the upper tier – reserved for Gods who must be worshiped with Gold ingots/money, middle tier – ancestors and junior gods who receive silver and lower tier – the unknown spirits receive heavily inflated notes (trillions of dollars per note). The yellow tacks that you see in the second picture below are “road paving” money that gets paid to the border guards of hell to make the path of the deceased smooth – what, why can’t hell have corruption?! 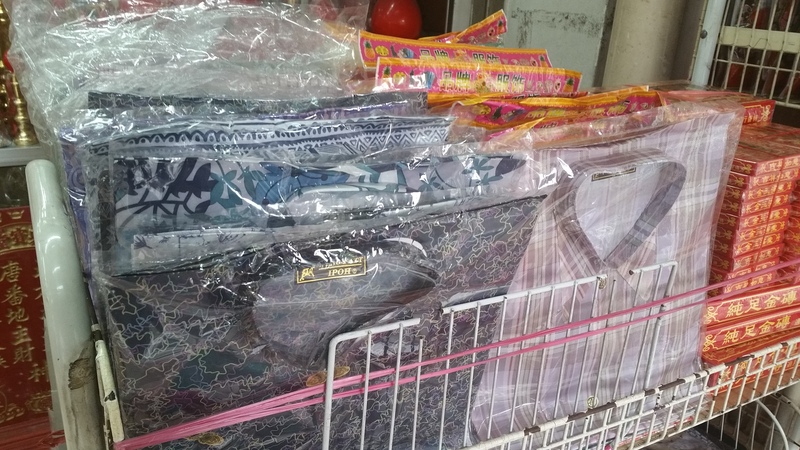 Apart from burning joss paper, the modern culture has spun many other types of joss items, from ipads to bungalows. 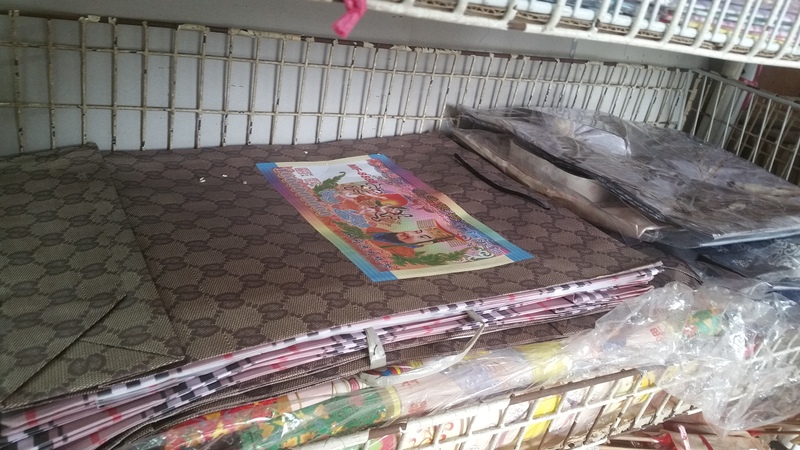 Things have gone quite crazy in China, including strippers at funerals. In this particular example, a less extreme version includes fashion items such as clothes and bags. But you can’t just burn money, man does not live on bread alone. The spirits too cannot live on money alone, they need to be fed and they need to know where to claim their money. To do that there needs to be light as well as address for the spirits to know where to go. That explains the large red candles. Think of it as lighting a house, you need to light a spiritual house too. When candles are lit, there is prayer going on. In this way, it really is not very different from worship in non-Chinese religions. 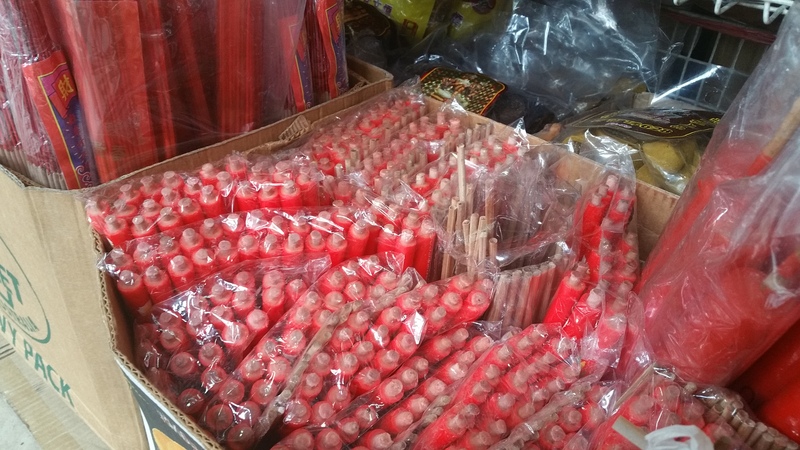 Then you also need to feed the deceased and this is marked out by joss sticks. The understanding goes that spirits feed on the incense of joss stick and so the ever shortening joss stick represents spirits feeding on the incense. Candles to light the way, with the occasional red paper (and name of the deceased) to stake the place for the deceased, joss sticks to feed the spirits and money to enrich them. Then there are the getais to entertain them with music and movie (well, wayang). These form the basis of the burning of items for the deceased that you will soon see across the island in the next few days (beginning 3rd August this year and lasting a month). It may look like superstition, but when you dig deeper, what seems like superstition is a traditional practice derived from a philosophical idea – filial piety.